Stuart recently completed his MA in Fine Art at Margaret Street. Through his work as both a student and a practising artist, he has become fascinated by the ways in which people interact with their environments, and how the collective memory of a place continues to impact upon the inhabitants and users within it. Through a variety of media, he explores the relationships between disparate elements of a particular place, often setting small, overlooked details within a wider historical framework. This frequently involves a lengthy period of research and documentation, not only in archives and libraries, but also during field visits. I contemplate the School of Art and see streamers of connectivity and potential spilling out from every architectural detail. The building screams at me and blinds me with its multifarious voices. Stuart chose the title for his work after being allocated F.05 for his show and remembering that it was labelled Private Room in a floor plan in the 1908 prospectus for the School of Art that he found in the Archives. He explained that, during the show, people were unsure whether they were allowed to enter, particularly as there was a jacket over the chair behind the lit desk in the room. However, they were persuaded to do so, and many interacted with the various different items on the desk.This reminded me of the comments made by some students when the Archives were based at Margaret Street, to the effect they were unsure whether they were allowed to come in. To the right of the entrance to Private Room was a framed screen print of a hashtag that mimicked the crushed strawberry glaze from the range of E.R. and W.H. Taylor’s internationally recognised Ruskin Pottery. Stuart used the hashtag symbol in the labels for each of the different elements of his work, thereby underlining the way in which, although they were linked, they each led outwards to different people and places linked to the building. There’s a comparison to be made here with the way in which information is gleaned from the Internet. Entering the room, the viewer felt as if they were interrupting a process. Work appeared to be going on at the lit desk strewn with pencils, a magnifying glass, a colour chart and part of an annotated conference paper that paid tribute to 19th-century headmaster Edward Taylor and his contribution to art. 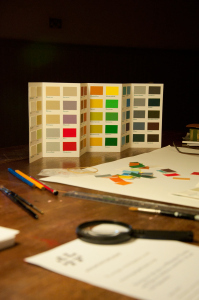 The colour chart, #MargaretStreetColours, drew upon those created by heritage paint companies such as Farrow & Ball. Some of the colours were based on close observation of particular details of the mosaic tiles, carvings and stained glass in the building and others on historical fact. Others – like ‘Sitnah’ - left questions hanging in a way familiar to those who have undertaken archival research and are left wanting to fill in the gaps in their information. The exhibit also referred to the basic building materials used in the construction of the School of Art, Horsley Castle stone and Adderley Park brick. #HCSReprise(greystone) comprised two lumps of Horsley Castle stone, one on the corner of the desk and the other a few feet away on a sculptor’s easel, and each carved with a gilded square bracket. Closer inspection revealed that the brackets were turned away from each other as if to include the Derbyshire quarries they were pulled from and those who worked them. On another desk in the darker corner of the room was an Adderley Park brick caught in a Mobius strip of paper on which the names of the makers of the bricks for the School of Art - George Burke and Richard Elson – and the details of the brick-making process were recalled. Stuart Mugridge, #aglassofsweetandstrangecolour(slides), MA show, 2014. “we do not want his [the artist’s] mind to be like a badly blown glass that distorts what we see through it, but like a glass of sweet and strange colour, that gives new tones to what we see through it, and a glass of rare strength and clearness too, to let us see more than we could ourselves, and bring nature up to us and near to us”. In #aglassofsweetandstrangecolour(slides) the scales and themes disrupted the Venetian Gothic architecture, yet were born from the materials and spirit of the institution. Similarly, archival documents - though part of the raw material of history - can be used in creative ways to enable us to look at the past differently. Why not explore the possibilities for yourself? Conversation with Stuart Mugridge, October 2014. Stuart Mugridge's blog about the two years he spent studying for his MA, written October 2012 - September 2014, http://2yearsatmargaretstreet.wordpress.com. Stuart Mugridge, Artist's statement, August 2014. Stuart Mugridge, Leaflet accompanying the Private Room installation for the MA Final Show, August 2014.